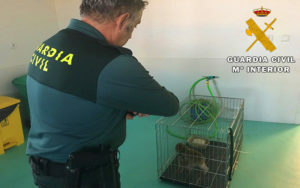 A 25-year old man is facing charges for illegal trafficking of a protected species after Guardia Civil at Almeria port came across a Barbary Macaque monkey in the back of a car heading for central Europe. Officers were carrying out a routine vehicle check when they heard strange noises coming from inside the car. The vehicle had tinted windows, so they couldn’t see inside, and when they asked the driver if he had anything to declare he insisted he didn’t. Suspicious, the officers decided to search the car, discovering the little monkey half hidden under the seats and attached to a chair by a leash. The vehicle occupant had no paperwork authorizing the possession or transport of the animal. ILLEGAL: The detained individual has no documentation authorising the ownership or transport of the monkey. Probably stolen in Gibraltar. Hoping they pay for their nasty deed .